13 After the wise men were gone, an angel of the Lord appeared to Joseph in a dream. “Get up! 14 That night Joseph left for Egypt with the child and Mary, his mother. Because Mary is the only female in this passage, I automatically find myself wanting to identify with her. Yet when I really think about it, we actually have very little in common. I am neither a teenager, a married woman, a mother, nor subject to life or death based on my decision making skills. I can’t even begin to imagine the stress of being a teenage mother recovering from giving birth in a barn. Let alone just days later being told I need to leave immediately without time to prepare anything. But this is what God asked of Mary. And while from my millennial and earthly point of view, it was asking a lot, from His vantage point, it was another opportunity for Him to show His power in sustaining His people in even the most dire of circumstances. On the topic of God’s power: we are often told throughout the Bible that His power is made perfect in our weakness. Mary and Joseph’s escape with Jesus makes them refugees, a status that many would say puts them in a remarkably weak position in society. It is also a status which I believe really cannot be fully understood until experienced. I like to think that this means Jesus feels a special solidarity with refugees undergoing even the most horrific of crises, not only because of his dedication to the poor and meek, but also because he and his family probably suffered through similar hardships. More likely than not, countless people turned away Jesus, Mary, and Joseph from their houses, neglected to help provide for them, and may have even discriminated against them for being foreigners. But how would people have treated them had they known that Jesus was the son of God? Or that he going to grow up and change the world both during their lifetimes and for thousands of years beyond? My guess is they would have reacted a bit differently, and may have even gone out of their way to help. Who are we turning away, neglecting to provide for, and possibly even unfairly judging? And are we doing so simply because we perceive them as foreigners, even though they were forced to flee from their country, for reasons completely outside of their control? Most importantly, are our neglect and indifference, to blame for people in our own backyards not having the means to provide for themselves, or feeling unwanted, inadequate, or powerless? Many of these foreigners that are deemed as lesser or unwelcome are simply strangers who need our kindness. As Christians, we are called to allow our weakness of being judgmental and exclusionary toward strangers be made perfect in His power through caring for, and welcoming foreigners as if they were Jesus himself. We should listen to their stories, and hear how they came to be our physical neighbor, and not just our metaphorical one that the parables told us to love. What do we have to lose by listening to the story of a woman who was forced to leave her country just after giving birth in a primitive hospital abroad? Probably nothing. But what do we have to gain? Probably a whole lot of perspective, and maybe even a chance to understand the life of Jesus in an entirely new light. In this passage, the LORD is speaking through the prophet Malachi to the Israelites. The context: He is vowing swift judgement against those who do not fear Him. And who are those people? In a list of inequities he includes "those who thrust aside the alien". Other translations say, "turn aside the sojourner from his right" (ASV); "deprive the foreigners among you of justice" (NIV) . There is no distinction between one who treats the foreigner unfairly and one who lies, one who cheats on spouses or laborers, and more. Even sorcery is on an equal plane. All who are unrepentant of these sins will incur the swift judgement of God. Now this may not be the basis on which to build a national policy on immigrants and refugees--after all there are interests to balance, borders and a populace to secure and defend. Both Paul and Jesus admonish us to obey our leaders (although I think a case can be made that God's law is higher that human law). But this warning in Malachi must be of concern to us individual Christians. It is prescient to the parable of the sheep and the goats (Matthew 25), in which Jesus tells of judgement that will come down upon those who treat "the least of these" without compassion. It calls to mind the passage in 1John (20-21): 20 Those who say, “I love God,” and hate their brothers or sisters, are liars; for those who do not love a brother or sister whom they have seen, cannot love God whom they have not seen. 21 The commandment we have from him is this: those who love God must love their brothers and sisters also. 1John in turn echoes the greatest commandment, as Jesus states in Matthew 22: 37 “‘You shall love the Lord your God with all your heart, and with all your soul, and with all your mind.’ 38 This is the greatest and first commandment. 39 And a second is like it: ‘You shall love your neighbor as yourself.’ 40 On these two commandments hang all the law and the prophets.” Full circle to Malachi 3:5. Like the widow, the spouse, the laborer, and orphan--like all people we come into contact with-- foreigners are made in the image of God, and therefore worthy of respect, compassion and justice. This theme keeps repeating itself many places in the Bible as we can witness just in this Lenten blog series. Zechariah is a minor prophet and God gives this message to him to speak to the Israelites who have returned to Jerusalem following their exile in Babylon. These words were spoken around 2150 years ago and yet we are still wrestling with these issues today. God must get very frustrated with us. In many ways I seem so removed from the suffering in this world. I try to do my part, but is it enough? Am I afraid of getting too involved? In years past I have gotten involved, so why am I holding back now? But let me tell you about when I was involved and the rewards that came from that experience. The main thing I learned was compassion—seeing the struggles to survive in a foreign land. In 1979 our country was helping resettle Vietnamese refugees. Our family lived in a suburb of Cleveland, Ohio and we had just moved into a larger home with extra space. We felt blessed and needed to share that blessing with others. Ed and i made a commitment to use that new home to help others. Not long after moving in a plea was made on television for people to sponsor the “Boat People”, so we volunteered. Our family arrived in the middle of January with the temperatures hovering around zero. Instead of getting a family unit with a mother, father, and children, we only got the children. Four siblings ranging in age from 10 to 21, the older two being girls. Their parents had tried to escape with them, but were forced back. Our four had been in a refugee camp in Malaysia for eleven months and ﬂew directly to Cleveland, going from a warm climate to a frigid one. They were dressed in chemise type clothing, had a sweater, socks on their feet and ﬂip ﬂops. They not only got culture shock, but also climate shock! Our ﬁrst order of business was to get them proper clothing. We went to thrift shops where I quickly saw prejudice. The locals who frequented these shops did not want any foreigners coming into their space. I learned how to stand in long lines with them to get the government assistance that was to be provided. I experienced resistance when I tried to get the 16 year-old enrolled in our local high school and eventually settled for English as a 2nd Language classes at the public library in downtown Cleveland. I had to teach them how to take busses to get to their classes. Being able to communicate with them was difﬁcult at ﬁrst, but they had taken some English classes in the refugee camp and could write some words, pronunciation was a big hurdle. I have so many stories to tell about the four months they stayed with us, but this blog would become an epistle. If you are interested, we could chat sometime. I want to dwell on the good that came from that experience. Halfway through the time spent with us, their parents and a 6 year-old brother were able to escape Viet Nam and come to the Cleveland area to be sponsored by another family. Also an older brother who was married and had a baby son, Tai Lan, named for the refugee camp where he was born, also came to our area. There were now ten members of their family relocated to Cleveland. We helped them ﬁnd a place to rent to all ten of them, which is another story. They were very frugal and four of the ten were able to get jobs. Fast forward, they now live in Stanton, CA, and each have jobs and own their own homes. The youngest son graduated from Cal State Fullerton. Our family beneﬁted too. Our sons were 5 and 7 and they quickly accepted the addition to our family. There was no jealousy. The 10 year-old went to school with our sons. They learned what it means to share, especially when others have nothing. I learned that when you take risks and allow yourself to become vulnerable, God provides. I learned that neighbors, family, and friends would step in an help when I got swamped. I learned that with the help we provided, four foreigners became self-sufﬁcient and productive members of their new country. I learned how grateful they were for our hospitality. The oldest girl even took my name when she became a citizen. That experience was very positive and we volunteered again the next year and had a family of three, a mother and two sons, 19 and 21. However, that time we asked our church to help sponsor them. We housed them, but volunteers from our church took the rest of the responsibilities, i.e. teaching them transportation, getting them into classes, getting them clothing, ﬁnding an apartment to rent, taking them shopping for furniture, etc. Would I do it again? Yes, when God calls. I believe God wants us to show compassion for our fellow man and to trust Him when he calls us to action. Pray with me: Lord, help us to be open to your call on our lives. Help us to befriend the widows, orphans, foreigners, and the poor. Help us to trust that you will walk with us on this journey. Help us to learn what it really means to befriend one of the least of these. In Christ’s name we pray. Amen. “The people of the land practice extortion and commit robbery; they oppress the poor and needy and mistreat the alien, denying them justice.” Ezekiel 22:29. We can put this verse in it’s proper context by reading the preceding verses where Ezekiel is calling out the sins of all of the people of Jerusalem, regardless of their station in life. Here we read of the transgressions practiced by the common people as well as the “princes of Israel.” The simple words used to convey the oppression of the poor and denial of justice to aliens by the common man, when contrasted with description of the atrocities of the sins of those in power, i.e., the priests, leaders and prophets whose transgressions are described in vivid detail elsewhere, makes this last verse seem almost like an afterthought. Extortion and a few civil rights abuses seem almost benign. As noted by Carlo in the preceding blog, the extent of evil by those in power was limited only by the human capacity to commit evil. Yet, we see here that God’s wrath at the people of Jerusalem includes without distinction, the powerless and those who had been lied to by their leaders concerning the Law. Those not in power will not be able to escape judgment by pleading ignorance, mitigating circumstances or that justice should be meted out on a sliding scale because God is not willing to adjust his punishment according to such modern concepts. In fact, we learn in the very next verse that God looks in vain for a man who had repented and could defend the city of Jerusalem. But he does look. The fact that God was willing to spare the city if he could find one deserving man tells us that God puts great store in personal responsibility. One can not escape responsibility by blaming high ranking people. God does not recognize the so called Nuremberg defense. Nor does God draw a great distinction between the manner in which people sin. We see a parallel between ancient Jerusalem and our modern society in our individual treatment of the strangers in our land. Granted, we may not be involved in human trafficking, slavery and the like. We may not employ dozens of illegal immigrants at a sweatshop, car wash or even a restaurant in order to pay less or because we believe “these people” will be more compliant. We may not short-change a person because we know we will not see them again or employ someone we know is here illegally. We may even disguise our disgust with the smelly homeless man in the coffee shop or carefully watch our words when confronted with someone we perceive as “different” so as not to offend, however I think this verse is a warning to us - not just as a nation, a region or a city, but individually, that these things are not enough. I believe God is calling on us to change our hearts. God has called the prophet Ezekiel to judge the city of Jerusalem. The city and her inhabitants (society) are guilty of transgressions, and the charges are very serious. To shed the blood of the innocent, to dishonor father and mother, and to oppress the widow, the fatherless or the stranger are all serious violations of the Law. Israel has been told in numerous places that these acts are sinful. We can read about them in such places as the Commandments, Deuteronomy 24:14, Leviticus 20:9, and Exodus 22:21-24. However, the inhabitants of Jerusalem, especially the powerful, had no regard for the Law; the extent of evil which was committed was only limited by the capacity to commit evil. Reading the above verses made me wonder: how would our city fare if judged in the same way? How does this society treat the defenseless and the disadvantaged? How do we treat fathers and mothers or the orphan? Twenty-first century America is not very different from Jerusalem during the time of Ezekiel. The widow and orphan are marginalized and ignored. Some become homeless, forced to sleep in the streets of our city. We view those most in need of compassion as a problem. Equally troublesome are the ways foreigners are excluded from society and are not given the same opportunities as everybody else. Children from other lands are brought here to be exploited in the most deprived ways. The list is rather lengthy and every single transgression need not be enumerated. But the fact is-this is our city. To make change, I think we need to start with ourselves. I was so distraught by the programming on mainstream television that (amongst other things) often dishonors the parent/adult characters-I cancelled cable. While this change doesn't solve our city’s problem, it does send a message to my kids that I honor God’s concept of family. I’ve also learned that if I’m going to try to change, then I’m going to have to get used to feeling uncomfortable. A couple of weeks ago, while I was walking in Pasadena, I noticed a homeless man sitting on the curb. I bought him a sandwich and when I handed it to him I realized he wanted my company more than the food I had to offer. But I wasn't comfortable with giving him my time or companionship. He shared with me how he had traveled from the Midwest in hopes of living in a warmer climate. I felt awkward and at a loss for words. I didn't get the immediate gratification of feeling good about myself for having “helped” him. As disastrous as I felt our encounter was, it was a first step for me. Normally, when I’m stopped at a light and someone standing on the corner is asking for money, I give him some without even making eye contact. For me, these examples are small steps, but they’re small steps toward meaningful change. In both cases, I was drawn to reflect upon what matters to God and to pray for His guidance and presence especially when I come face to face with the injustices of our society. God’s command to do “no wrong or violence to the foreigner, the fatherless, or the widow” comes in a chapter of Jeremiah’s book that lays out God’s judgement against wicked kings. In the chapter before, God’s wrath towards those who disobey this command is evident: “rescue from the hand of the oppressor the one who has been robbed, or my wrath will break out and burn like fire because of the evil you have done-burn with no one to quench it” (21:12). I’m really drawn to this phrase “rescue from the hand of the oppressor,” repeated in both Chapters 21 and 22. The sentence structure makes it sound like we are to save victims in the very act of injustice, in the moment it’s happening. The imperative commands “Do” and “Rescue” call us to take immediate action. These observations led me to ponder about what is at the heart of God’s concern and to reflect a little bit about my own experiences as an immigrant. My family and I emigrated from Iran six months before the Islamic Revolution in 1979, and growing up, I often felt confused about my identity. At school, I did my best to fit in-to not draw attention to my difference (which is really hard to do when you have a name like mine!). At home I was reminded to never forget my roots. The constant tug from one culture to the other convinced me I wasn’t “normal” and didn’t belong. I’m not proud to have these feelings but if I can be totally honest, I feel an inexplicable discomfort when I see newly arrived Armenian immigrants-despite the fact that I’m an immigrantmyself. I wonder why they have to be so different. I tried so hard to blend in, why can’t they? Their presence reminds me of who I was-of who I am. I think this is the most subversive part of oppression, when it becomes internalized and turns into self-hatred. In God’s eyes, the foreigner, fatherless, and widow all share a similar loss. I think the similarity may be in this feeling of not belonging. The fatherless and widow have lost the head of their family. The foreigner has lost the home of his forefathers. They are displaced and feel abandoned. God’s promise to us is that He will never leave us nor forsake us (Deuteronomy 31:6). As His people, we must take on the hands and feet of Christ-we must reach out to those on the fringes of society who are most vulnerable to believing God has abandoned them. We must share the love, mercy, and peace we’ve received from Jesus; otherwise, we put into jeopardy God’s covenant. God clearly wants the Israelites (then) and us (today) to love God (not go after other gods), and to love others (truly act justly one with another). The key word for me is “justly” – to act according to what is morally right, equitable in manner with justice. Equitable - being equal in status, rights, and opportunities. Following World War II the GI Bill was set up to recognize the our returning GI’s by providing free college education and assistance with housing. Unfortunately, only 4% of the returning black GI’s were able to access the free education, due in part to limited placement opportunities and the need for many of them to work to support their families. Of one million black GI’s, only 4% were able to access the free education. Between the 1970’s and today the U.S. prison population has increased 767%! (from 300,000 to 2,300,000). We now have the highest incarceration rate in the world. Our “three strike” laws were meant to deter repeat offenders, but they also made writing a bad check or committing a petty theft or a minor property crime an offense that can result in life imprisonment. And when combined with our efforts to curb the escalating drug problem our prisons and jails overflowed. Unfortunately, there has been a disproportionate impact on blacks. Of all males born in 2001 it is estimated 1 in 15 will be imprisoned, but for black males it is 1 in 3 will be imprisoned. Even though studies have consistently shown that people of all colors use and sell drugs at remarkably similar rates, in some states 80-90 percent of all imprisoned drug offenders are black. Federal funding flows to those state and local law enforcement agencies that dramatically boost the sheer volume of drug arrests; agencies don’t get rewarded to bring down the drug bosses or arrest violent offenders, they are rewarded in cash for arresting people en masse *drug arrests show a 5 to 1 ration for possession over sales. As I ponder today’s scripture in light of what I am learning I can’t help but think as a country we have work right here to do to truly have justice for all. When the Israelites asked, “What does the Lord require of us?” The response was: “ To do justice, love kindness and walk humbly with your God.” (Micah 6:8b). Now that I know this, what am I going to do about it? I would love to discuss this issue with others. If you would be interested please contact me. Perhaps together we can find some ways to take action? One of the teachings I remember from Mr. McClair’s sixth grade Sunday School class here at LCPC was that I am to be the hands and feet of Christ here on earth. That what I do with my hands, feet, mouth, money and time should be a reflection of my love for and faith in God. So how does the LORD watch over the foreigner and sustain the fatherless and widow? In one significant way He does it through you and me. He places a call upon our hearts to welcome the stranger, to not let fear stand in our way of watching over the foreigner and sustaining the fatherless and widow. These may seem like scary times but it is in the scary times that God gives us the opportunity to stand bolder. Just as we were once strangers to the Lord's table but were welcomed and just like we could not earn our way to the table we now invite those that are strangers to our table as well. The Bible repeatedly shows us that God cares about those that are disempowered, just look at the scripture we are studying this Lenten season. There may be debates about what to do for those that have been displaced or are seeking a better life, but there can be little debate that God has called us to watch over them. Wouldn’t it be great if we could help frustrate the wicked? How are we the hands and feet of Christ as we work together to frustrate the wicked? By not giving into the fear, by saying that in anyway I can, I will watch over the foreigner and sustain the fatherless and the widow. Taking that call seriously would frustrate the wicked to no end. Let us all act upon the things we say we believe in and make room at the table for all. All-embracing God, no one is a stranger to you and no one is ever far from your loving care. In your kindness, watch over refugees and exiles. For those separated from their loved ones when they fled war and conflict, re-unite them and give them protection. Inspire us to make our churches places of refuge for those in search of safety and peace. Help us to show by our words and our actions the welcome you gave to the strangers you met. We pray this, in the name of our God who unsettles and inspires us, We give our praise and thanks. Let’s be honest… who would want to write about these two verses from Psalm 94? Not me! Yet- here we are, and if you’re reading this, I apologize in advance for my feeble attempts at addressing this passage. In our very secular culture and even in churches, God is portrayed as two very distinct opposites- we have the “hippy” version of Jesus who is all about love and peace. On the other end of the spectrum is the God who is watching and judging our every thought and deed just waiting to pounce when we make one wrong move. There are bits and pieces of truth to these depictions; however, they do not come close to capturing the complete picture of our Great God (in the best way our minuscule human minds can possibly comprehend). While the Bible tells us that God is love and He commands us to love one another, it also says that “God is the judge” (Psalm 75:7) and that “for those who are self-seeking and who reject the truth and follow evil, there will be wrath and anger” (Romans 2:8). If you’re anything like me, the passages of the Bible that describe God’s punishment (a huge chunk of the Old Testament) or speak of His wrath for those who sin against Him are often ignored. I skim those verses at best and skip over them at worst. It’s not that I doubt them; rather, I have trouble reconciling them with the God of love. I only want to read of God’s love and grace. Unfortunately, in our fallen world, we cannot have one without the other. There is Good and Evil. Our God is filled with mercy and love, but there are conditions to His grace and mercy. He freely offers eternal life through Jesus Christ, but we must accept that gift by believing in Jesus and recognizing our utter sinfulness apart from Him. If we choose to ignore His gift and continue living in sin, we will not receive the salvation He so longs to give us. Now you understand why these two verses I was assigned for this Lenten blog are so difficult for me. They remind me that God is the Judge of all. They remind me that God does see and cares greatly about all we do, think, and say. It instills within me a new fear of the Lord. Not a fear in the sense of doom or dread or eternal damnation (as a believer I hold to the promise of John 3:16), but a renewed understanding of how great and powerful He is and how all things are in His control. Proverbs 9:10 says, “the fear of the Lord is the beginning of wisdom.” Perhaps these verses can be the catalyst for us to grow in wisdom as a nation, as a church, and as individuals. God does see evil in this world, and He will avenge those who commit the atrocities of which the psalmist describes. In a world where evil seems to triumph over good, we can find peace in the knowledge that God is the Judge, and “He will bring every deed into judgement, including every hidden thing, whether it is good or evil” (Ecclesiastes 12:14). In the meantime, may we hate what God hates and abide by the religion that the Lord accepts as pure and faultless: “to look after orphans and widows in their distress and keep [ourselves] from being polluted by the world” (James 1:27). In these words, Job is projecting the Lord as there is no greater Father or Advocate than Him. We were strangers once and He found us and provided for us. He has taken up our case before the Father, and as Christians, we are called to pick up this mantle and serve those in need in the same ways. Our church is very mindful of the needs of others around the world and we can see that it is truly wonderful to be able to serve the Lord by helping others. But in doing so, when we witness devastation and suffering, what we really want to know is why? Why would a God who is great and good allow families and children to suffer? Over time, we see that everyone experiences suffering, and at some point in our own life we might even find ourselves asking horrible questions like why do I have to walk through cancer? Why is my home being taken from me? Why is my job going away? Why did my best friend betray me? Why is my family breaking apart? Why did my child die? Like Job, we may even know that we did not bring the suffering upon ourselves through willful sin and we want an explanation from God. What is happening? Why is this happening? Where is God when this is happening? Job asks all of these questions, too, but the question that truly dominates the book of Job is “Who?” Who is this Sovereign God that ordains all of this suffering? We want to know why, and as we see in the Book of Job instead of telling us why, God reveals Himself and draws us closer to Him. We really just want our life and all our stuff to be restored to the way it was, but in His revelation, God exposes our limited and erroneous thinking. In fact, it is in our suffering that God shows Himself to be our treasure. He is our Creator, our Sustainer, and our Savior. His power is great and His knowledge is perfect. His purpose will not be thwarted. And most poignantly, His love and mercy are personal; He is our Friend. We can trust in a God like that, a God who is personally and intimately involved in our life. In awe, when Job realizes who God truly is, his immediate response is to humble himself by saying, “Therefore I despise myself and repent in dust and ashes” (Job 42:6). Job despises the small view he held of God in his suffering and he turns to a corrected grand view of God. Job finally sees that God is his treasure, God is his goal, and when the goal of our life is God Himself and not the things of God, then, like Job, we can view our suffering as a pathway to finding deeper and deeper treasure in Him. At the end of the book, we see Job’s health and status restored, so is God telling us that if we just walk through suffering we’ll get all our stuff back? No, that’s not the message. That discounts Job’s deep pain and horrendous loss – nothing is going to bring back his 10 children. But, the reason the book ends that way is to show us that suffering doesn't have the last word. Satan doesn't have the last word. The cross doesn't even have the last word. Resurrection has the last word. Hope has the last word. Victory has the last word. God has the last word. Thus, as we the people of God walk through suffering, we can know that suffering is not the end. God is the end and He has the last word every time. Praise God. I’d never really noticed how much God has to say about the way we should be treating and caring for foreigners in our midst, until LCPC focused on the “I was a Stranger” theme. I knew we were to be tending to the needs of widows and orphans, but did I just pass right over the foreigner part? With the Global Refugee Crisis being in the forefront of the news these days, there’s no ignoring the fact that there are over 65 million people who are estranged from their homes, communities and countries. The Bible is very clear that we all have a responsibility to these people. Lee says the Bible doesn’t waste words, so if something is repeated, it is of utmost importance in God’s eyes. I’ve been reading all the blog posts and seeing God’s recurring commands to care for and treat foreigners fairly. This verse, however, is a bit different from the others. It commands fair treatment of foreigners, but there is a curse involved for those who disobey! That word really caught my attention. Curses are the opposite of blessings. God lists the blessings of being obedient in chapter 28 of Deuteronomy – blessings on the fruits of our wombs, our crops, our livestock, our land, strength against our enemies and being established as God’s holy people. The curse for disobeying God’s command is that these blessings are withheld from us. Seems like the curse encompasses just about all aspects of our lives. What are ways we might withhold justice from a foreigner, and incur this curse? Other biblical translations use phrases like “obstructs or deprives foreigners of their rights” or “anyone who isn’t fair in the way he treats foreigners.” I can’t think of a personal way I have withheld justice from a foreigner, but I can certainly think of times I have been frustrated, impatient or have judged people from other cultures who do things differently from us native Californians. I’m guessing God wouldn’t view that as fair treatment. If I was living in a war torn country where my family wasn’t safe from violence and terrorism, I probably wouldn’t feel I was being treated fairly if I wasn’t allowed entry into another country so I could protect my precious family. I think God might agree. I feel pretty powerless to make much of a difference for the millions of refugees fleeing right now, but God calls me to do something. I can make a Refugee Welcome Kit. I can make a donation to an organization directly working with refugees. I can sponsor a child through Compassion or World Vision who is a refugee in another country. I can use my voice to stand up against laws that feel discriminating to refugees. I can pray for protection and for these people’s needs to be met. I can befriend a stranger who has moved into my own community and show them God’s love by helping them get settled. And about that curse? We were all cursed because we have never been able to keep God’s commands perfectly. Praise God that Jesus bore the curse for all of us. "When you have finished setting aside a tenth of all your produce in the third year, the year of the tithe, you shall give it to the Levite, the foreigner, the fatherless and the widow, so that they may eat in your towns and be satisfied." From Study Notes in the NIV Life Application Study Bible: "This law is repeated from 14:28-29. The people were to give their tithe to the needy every third year. This amounts to one-third of their giving on a three-year cycle. Though we are not under this law today, the New Testament reminds us not to forget the poor. Consider giving one-third of your annual contribution to overseas ministries, or to relief for the poor, orphans, and widows." From Study Notes in the Amplified Bible: "This is a reference to a benevolence offering given every three years (called the "tithe of the poor" by the ancient rabbis). This was in addition to the "Storehouse Tithe," brought to the sanctuary and the "Pilgrimage Tithe" used for the expenses of going to Jerusalem three times each year. Together, the Old Testament tithe amounted to a third of the total." Tithing is our way of giving back to God a portion of what He has graciously and generously given to us. Today, I don't think we give those second and third tithes as described in the Amplified Bible. Instead we give gifts and offerings, in addition to our tithe. The Bible study notes explain how we should apply this verse to our lives today. Some people may be hesitant to step out in faith and help the needy because they themselves fear refugees or those different from them, or they fear that God will not provide for them if they give away anything they own. I'd gently say that fear is not from God (2 Timothy 1:7); God loves a cheerful giver (2 Corinthians 9:6-7) and God promises to provide for us (Matthew 6:33). I have a very distinct memory of reading the book of Ruth for the first time. I was about eleven years old and for the first time in nine years, I was on a trip without my mom or my nana. I was visiting my Uncle Shawn and Aunt Teresa in Sausalito for a few days with my younger cousin and although we were having a great time, the evenings brought with them homesickness. I missed my mom and nana so much that I could not fall asleep one night, so I picked up the Bible I had brought with me and flipped through it until I saw the book of Ruth. My nana’s name is Charlotte Ruth. I decided in that moment that I would read the book and it would help me feel close to my nana. The book of Ruth was way better than I expected. I became engrossed in the love story of Ruth and Boaz. For anyone not familiar, Ruth is a widow who moves to Bethlehem with her mother-in-law, Naomi. Naomi is originally from Bethlehem but Ruth is a Moabite. She is a foreigner there. The two women have no money or food and so Naomi, knowing the Jewish law, sends Ruth to the field of Boaz, to glean the grain that is left over by the workers in Boaz’ field. As one can see in the verse above, God made clear that if a sheaf of grain is dropped or ignored during harvest, then that sheaf should go to someone who did not have the luxury of dropping or ignoring food. Specifically, the sheaf should be left for the foreigner, fatherless and widow. Boaz sees Ruth following his workers one day and picking up the extra bits and pieces of grain. Not only does Boaz welcome Ruth’s presence. He goes so far as to tell his workers not to bother Ruth but instead to actually pull out sheaves of grain from their own bundles and leave them on the ground for her to glean. In my eleven year old brain, this was the equivalent of John Cusack holding up the boom box in Say Anything. It was romance at its best. Boaz went above and beyond the call of the law for the woman who would eventually become his wife. Boaz and Ruth even get to be part of Jesus’ ancestral line. For years after reading this for the first time, I equated Boaz’ actions with a romantic ideal. When you met “the one” you would go above and beyond what was required for them. You wouldn’t just give them an overlooked sheaf, you would pull out a whole bunch on their behalf. Nowadays, I still love the book of Ruth but not because I can picture it as a Meg Ryan movie. I don't consider this book to be about romance anymore. But I do see it as a love story. It is about neighbor love. 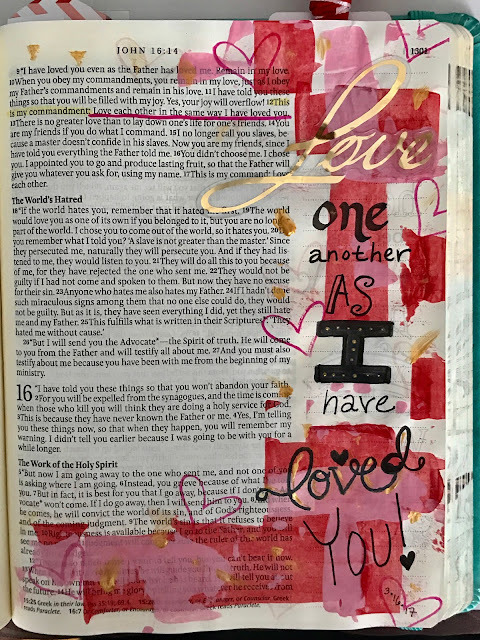 The Lord commands us to love our neighbor and that means loving whomever God brings into our lives – be they husband or stranger, family or foreigner. Neighbor love casts a wide net of generosity. As a child, I always imagined myself as Ruth - a woman being swept off her feet. And in a way, I believe I am Ruth... we all are. I have been shown a completely undeserved- above-and-beyond-imagination-makes-the-movies-look-silly kind of love. The love of Jesus Christ - who saw that I was impoverished by my sin and hungry for closeness with God. And so He rescued me from that hunger with lavish love. He swept me off my feet, and now His request is simple. He wants me to take some of that amazing love He poured into my life and share it as neighbor love. He wants me to take His perfect, shining example and try to follow it the best way a sinful person like me can. He wants me to start being a Boaz. "Do not deprive the foreigner or the fatherless of justice, or take the cloak of the widow as a pledge. Remember that you were slaves in Egypt and the Lord your God redeemed you from there. That is why I command you to do this." A friend of mine suddenly became a widow when her husband collapsed from a brain aneurysm. Unfortunately, the damage was irreversible and he died within two days. Knowing my friend's heart was broken, mine broke as well. I tried to stay up to date with all that was happening while feeling so helpless to help her. I prayed fervently! The day of the funeral, I saw her walk with such strength and grace I was reminded, that even in the midst of horrible tragedies, the Lord never leaves us. I truly believe he does carry us, especially in the darkest of times. I wanted to reach out, to tell her something to comfort her.. (so I sent cookies wrapped in love & prayer). I still pray for her and her two daughters day & night. I continue to search scripture for the right words.. and I always came back to this, "My command is this: Love each other as I have loved you." Remember, we are all strangers & foreigners in this land. This is not our home & we can't navigate it alone. Look up, lean in & lean over to a friend, neighbor or stranger.. and "Love each other as I have loved you." In these passages God is not really offering guidance about the specifics of the ordering of the relationship, rather He is giving us guidance about who we are supposed to be, regardless of the relationship. It’s not about politics, it’s about character. How different would things be today if we worried more about our character than our politics? (or our income, or our status, or our taste in movies….) Godliness is apolitical, and yet it would be amazing to witness how well politics would function if everyone were godly. During Lent we celebrate the time Jesus spent in the wilderness preparing Himself for public ministry. Jesus came, by His own admission, to establish God’s kingdom. That sounds political. Yet He did not spend that time in the wilderness writing manifestos, organizing a group, networking, or reading the news. He spent that time in prayer and meditation with His Father and resisting the temptation of the evil one. Even the Lord Incarnate worked on His character. God’s kingdom is based not on a political system, but on the people in it. If we are all godly people then God’s kingdom is present, monarchical, oligarchical, democratic or socialist though the government may be. It has been my privilege to travel a good bit of the world. – some of it behind the Iron Curtain during the Cold War. I have witnessed the Holy Spirit move mightily even in the bowels of the Soviet Union and active efforts to suppress it. God is bigger than our politics. There is a tradition of Lenten sacrifice. I’ve never really been into it, except when I was trying to lose weight. Wrong motive makes it a bit of a cheat. I think rather this Lent I will work on reordering priorities. Life does not permit me, or anyone really, 40 days in the wilderness. But I can make time with God more important than the news.